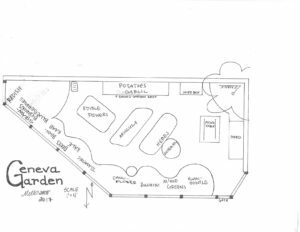 The Geneva Elementary School garden was established in 2010 with support from Common Threads, plus financial support from the PTA, and the hard work of many Geneva families who spent their weekends building the garden by hand. The garden is a small, tranquil place in view of a kindergarten classroom. It features a large herb garden, many sunflowers and tomatoes during the summer months. During the winter, fava beans can be seen growing in almost every bed. 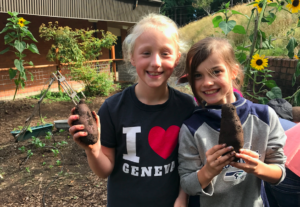 Every student at Geneva has the opportunity to get their hands dirty helping with a variety of garden tasks — all while learning about science, ecology and how our food is grown. Geneva Elementary has 295 square feet of growing space. It is located at 1401 Geneva Street, Bellingham WA 98229-5218. If this school is particularly near and dear to your heart, we invite you to become a Summer Garden Care Volunteer or a Sponsor! Geneva Elementary has a Common Threads Facebook Group you can join!